A few weeks ago we rounded up some eye-catching widgets for your Android device so it's only fair that we spend some time looking at a selection for iOS too, even if widgets aren't quite the same thing on both platforms. All of these apps will add functionality and flexibility and to the Notification Centre on your iOS 8 device, so get busy browsing and installing. If you don't already know, if you head to the Today screen in the Notification Centre, you can tap the Edit button to change the widgets that appear. Any widget with an app attached is automatically listed and eligible for inclusion. 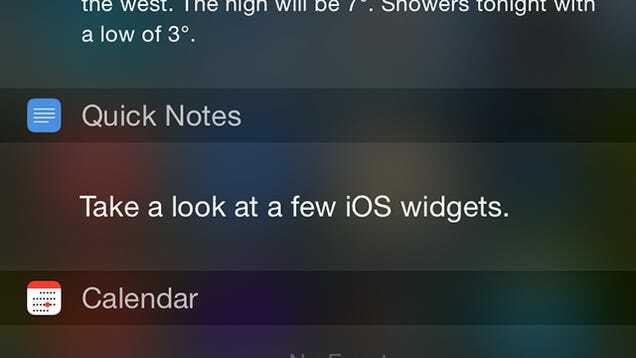 You can set up all sorts of widget icons and shortcuts with the help of Vidgets. 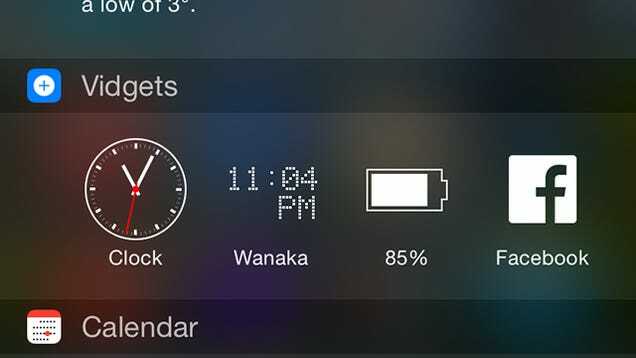 Available options cover your contacts, installed apps, clocks, system status, network settings, weather and more. Vidgets is completely free to use but you can upgrade in-app to get access to a few extra advanced widgets. 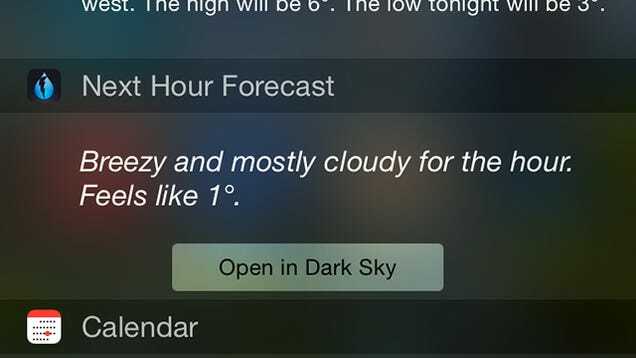 Yeah, fine, the Notification Centre has a built-in weather update on the Today pane by default, but we already know how great Dark Sky is and its Next Hour Forecast is a useful addition on top of iOS' own tools. Whether you're planning a hike or a family BBQ it's handy to know what's about to happen weather-wise. 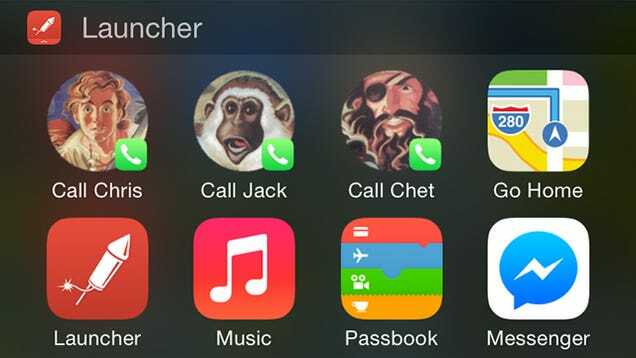 Launcher has had a few problems getting itself accepted and approved by Apple, but now it's back where it should be, giving you the ability to set up a customised list of shortcuts right in the Notification Centre. From traffic directions to social media accounts to favorite contacts, it's one of the most flexible widgets out there. 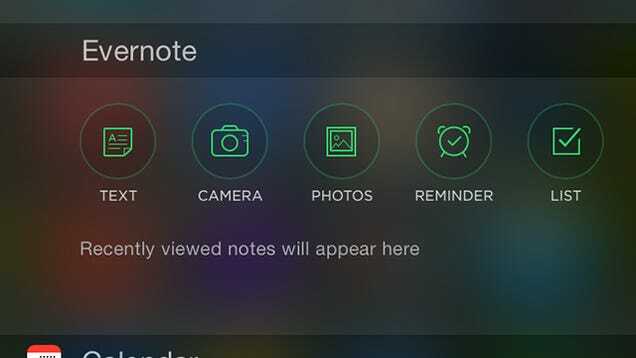 If you're a serious Evernote user then you want to be able to get at your notes and notebooks as quickly as you can, something the app's integrated widget makes possible. It lets you instantly create a text, photo, reminder or list note, and there's the option to display recently viewed notes underneath as well. The Notification Center works best when it's being used for at-a-glance information that saves you having to go to the trouble of opening up an actual app. 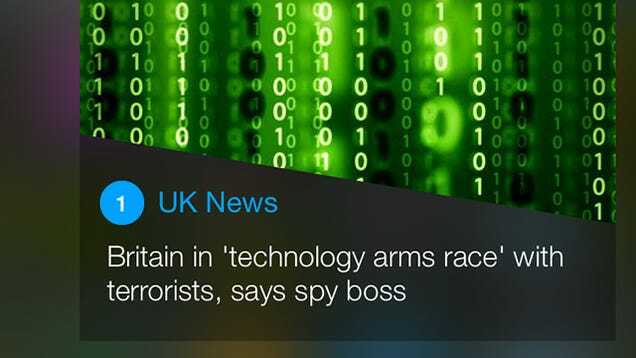 Enter Yahoo News Digest, one of the best tools for getting a brief overview of the news headlines while you wait in line or ride the subway to work. iOS 8 ushered in some handy new tools for battery management and usage analysis but what we don't yet have is a real-time percentage chart like the one in Android. 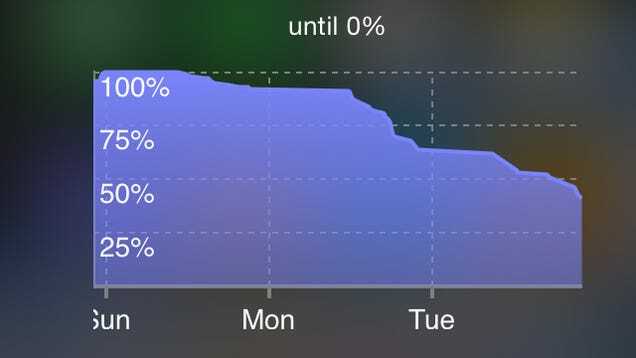 Battery Graph Widget gives you a much better idea of how fast your device's juice is being drained away and how long it's going to last. One of the questions you're likely to be asking yourself on a regular basis is 'how long's it going to take me to get home?' Well, wonder no more with ETA, a Google Now-style widget that lets you set custom destinations and works out journey times. It can integrate with most popular navigation apps too. 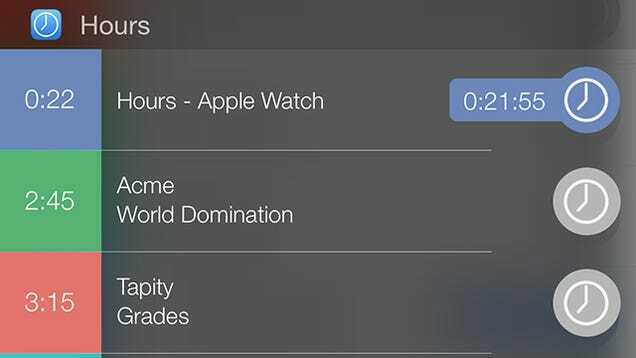 Not only is Hours a very elegant and intuitive time-tracking app, it also comes with a Notification Center widget that lets you quickly see how much of your time you're spending on each project, and start and stop the timers accordingly. It makes it much easier to stay on top of logging a long list of tasks. 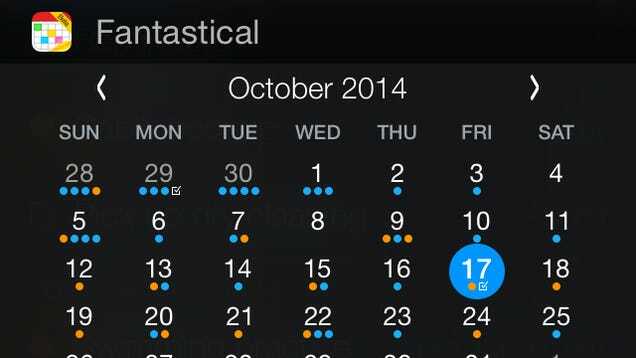 There are plenty of calendar apps available for iOS but few have a Today widget that's as aesthetically pleasing and as functional as the one built into Fantastical 2. You can show a calendar overview, as well as upcoming events and reminders, and interact with entries right from the Notification Centre. If you're looking for a smart personal assistant with widget support then 24me fits the bill nicely: it provides one central hub for all of your calendars, tasks and notes, integrating with a range of other services to automate as much of your daily life as possible. The widget provides a useful, at-a-glance overview. 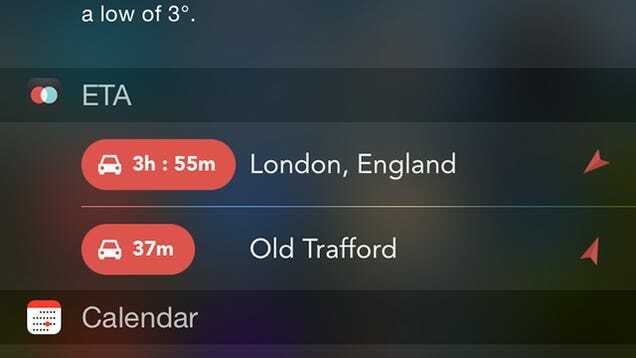 The best Notification Centre widgets let you take full control over what's shown on screen and that's the case with Quick Notes. 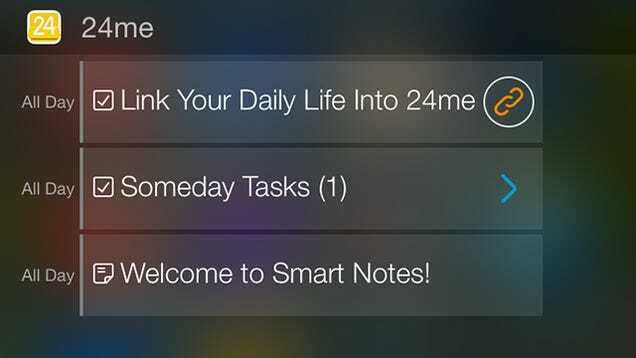 The notes themselves are simple but you can reach them directly from the Today screen as well as set notes to appear automatically at certain times and act as reminders. Day One has earned plenty of plaudits for its smooth and understated take on the digital journal, and it now comes with a widget of its own as well, which works a bit like Facebook in reminding you of events on this day in previous years. 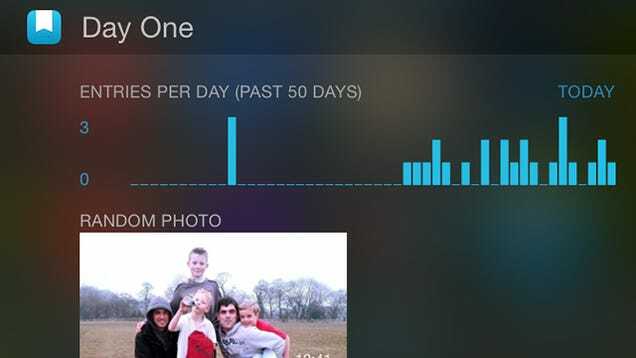 Random photos and your recent journal-writing progress can be shown too.